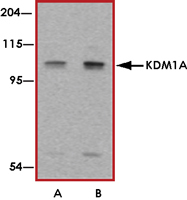 Sample Data :Western blot analysis of KDM1A in P815 cell lysate with KDM1A antibody at (A) 1 and (B) 2 ug/ml. 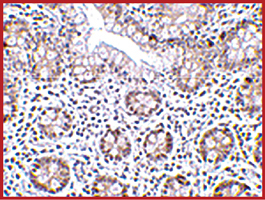 Sample Data :Immunohistochemistry of KDM1A in human small intestine tissue with KDM1A antibody at 2 ug/ml. Scientific Background :KDM1A or lysine (K)-specific demethylase 1A is a nuclear protein containing a SWIRM domain, a FAD-binding motif, and an amine oxidase domain that is a component of several histone deacetylase complexes and act as a histone demethylase. (1) H3K4 histone demethylase activity of KDM1A is partly responsible for the repressive activity of TAL1 and restricts TAL1 function in hematopoiesis (1). KDM1A plays an essential role for CoREST in demethylation of H3K4 both in vitro and in vivo (2). 1. Hu, X. et.al : LSD1-mediated epigenetic modification is required for TAL1 function and hematopoiesis. Proc. Nat. Acad. Sci. 106: 10141-10146, 2009. 2. Lee, M. G. et.al : An essential role for CoREST in nucleosomal histone 3 lysine 4 demethylation. Nature 437: 432-435, 200.